I’m a hot chocolate fiend. During the dot-com days, I started my day with a grande hot chocolate and a chocolate croissant from Starbucks. Yeah, not so much anymore. But as a treat for the holidays, I went and got myself a Starbucks peppermint hot chocolate this morning. Since I don’t drink coffee, I drink tea constantly, but a hot cocoa makes me super happy! 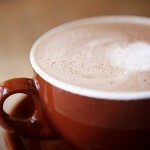 SFGate.com featured where to find the best hot chocolate in the Bay Area. Looks like Oaktown’s the place! The Chronicle recommends the Salted Caramel Hot Chocolate at the Bittersweet Cafe on College Avenue. Sounds scrumptious!